That several species of aphids can feed and coexist on the leaves of certain trees is puzzling. Of these aphids some only grow and reproduce actively in spring and autumn, and others only in summer. This temporal patterning in reproductive activity is well documented and common. In the past the summer reproductive diapause in the sycamore aphid was attributed to the low quality of the food available during summer to this and other aphids living on the leaves of deciduous trees. However, the fact that another species belonging to the same genus feeds on the same leaves and is reproductively active during summer indicates that it is unlikely that reproductive diapause in the sycamore aphid is mainly a response to poor food quality. The seasonal trend in temperature is the opposite of that in nutrition, low in spring and autumn and high in summer. A study of five species of aphids coexisting on the leaves of birch indicates that the temporal patterns in their reproductive activity are associated with differences in their thermal tolerances. The thermal tolerance range of each species, their thermal window, is approximately 20°C, with some species better adapted to and therefore reproductively active when temperatures are low in spring and autumn and other species when temperatures are high in summer. Thermal windows of 20°C are not specific to aphids as an analysis of similar data for 66 species from eight orders of insects indicates it is a general phenomenon. 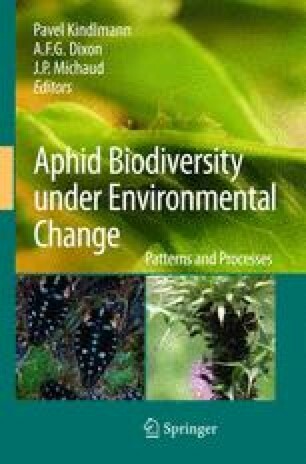 In addition, temperate species of aphid, like other poikilotherms, do better at low temperatures than subtropical and tropical species and vice versa. This indicates that it is more likely that a physiological constraint, their thermal windows, determines the seasonal dynamics and distribution of aphids, and also enables several species to coexist. It is a pleasure to thank Jonathan Thacker for helpful comments on this paper. AFGD thanks the Leverhulme Trust for the award of an Emeritus Fellowship that made this study possible.